Man has cultivated carrots for close to 5000 years. The origin of modern cultivars is believed to be the purple carrot which originated in Central Asia, specifically modern Afghanistan. By the 12th century carrots were being reported in Moorish Spain and from there they spread to the reminder of the west. 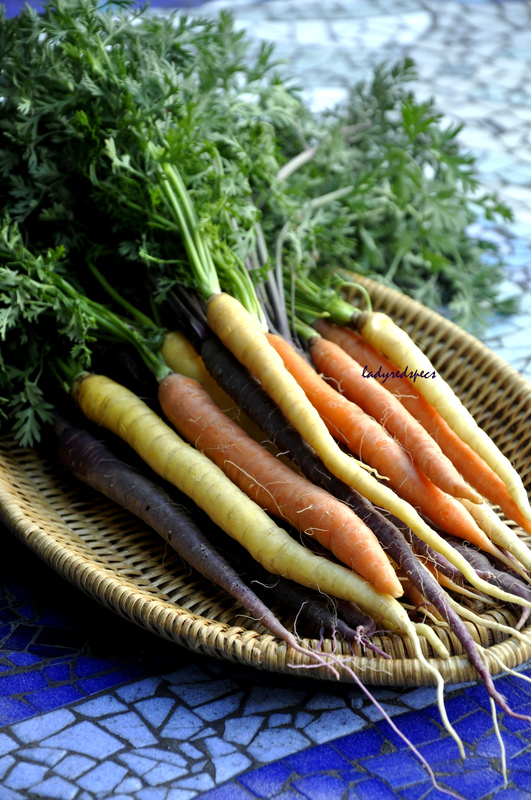 Orange carrots were unknown until the sixteenth century. It was 2007 before I encountered a carrot that was not orange. While visiting Rajahstan in 2007, I was served an unctuous sweet spiced halva made with carrots of a deep red hue. Not long after I returned home, purple and yellow carrots began to make an appearance in my local greengrocer. They quickly became the trendy vegetable de jour. Still considered exotic, their jewel box colours make them hard to resist, though I have to say the flavour disappoints if served unembellished. Remove the carrot tops and thoroughly scrub the skins, but do not peel the carrots. Split the larger carrots lengthwise. Toss the carrots in the oil, spice and seasonings, transfer to an oven tray and bake for 45 mins. Remove the carrots from the oven and allow to cool a little. Drizzle the pomegranate molasses over. Delicious served on a bed of Spiced Quinoia Salad. Looks lovely, Sandra and I love that picture of carrots piled up in that wagon. It’s interesting that you say the multi-coloured carrots need spicing up. It seems that the orange ones have more than colour going for them because they help make my soups and stews sweet. Carrots are great! I love Coles organic carrots, cheap, and loaded with flavour! 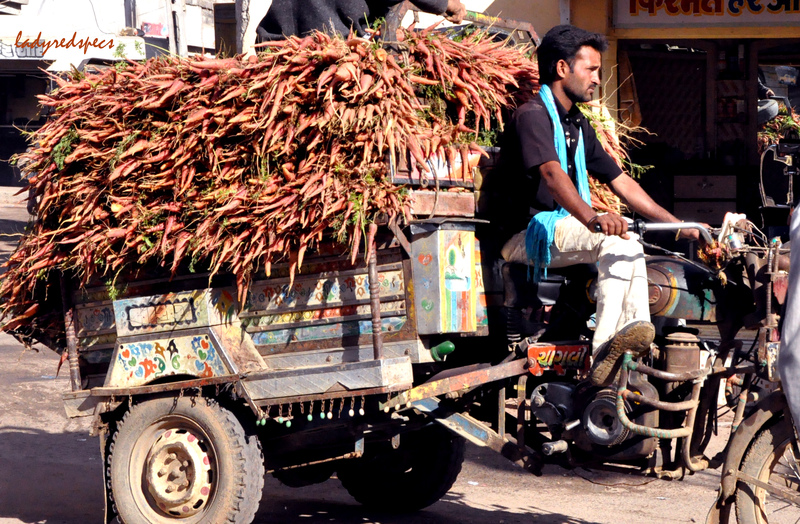 The heritage carrots look fabulous but… India sends your visual senses into overdrive, its a photographers paradise! Great post. Wish I could get heritage anything where I live! We’re very lucky in Melbourne! Thanks for that very interesting history lesson on the carrot. I wish I could try a purple carrot – we unfortunately only get the boring orange ones here 🙂 This dish does sound delicious I may just try it without the fancy carrots. Heritage carrots look special, but there is no flavour difference. The history of food is fascinating! 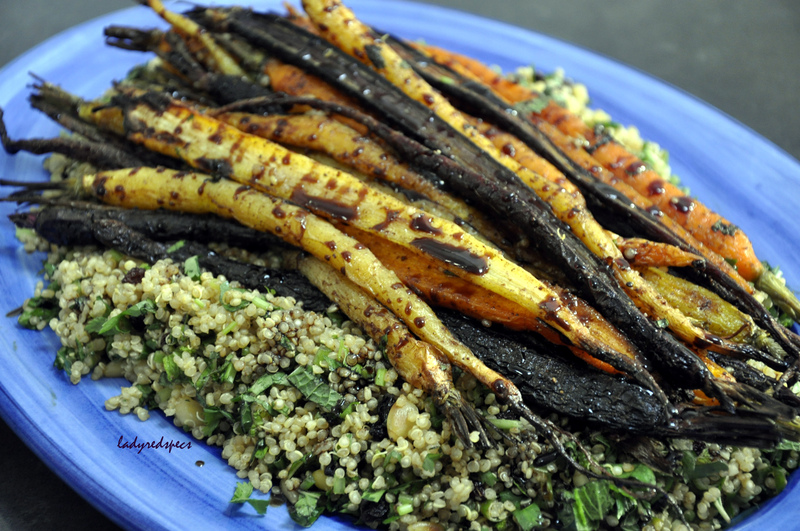 This entry was posted on April 17, 2013 by ladyredspecs in FODMAP diet, Food, Gluten Free, Light Savoury Dishes, Side Dishes & Salads, Vegan, Vegetarian and tagged roasted carrots, salad.